October 19, 2014 Nefer Khepri, Ph. D.
The Aquarius Gypsy Lenormand is both a Lenormand and a Gypsy divination deck. The first 36 cards of the 70-card deck are the traditional cards of the Lenormand system, numbered 1 – 36. Cards numbered 37 – 70 correspond to cards that traditionally comprise decks known as “gypsy” cards. The cards measure 3 ½ X 2 ½” individually and when stacked on top of one another, the deck measures 7/8” high. Although this is a thick deck, due to its small playing-card size it remains easy to shuffle. You have three options when using this deck, based upon my own experimentation. The Aquarius Gypsy Lenormand works great when using the traditional 36 Lenormand cards. You can then use the remaining Gypsy cards to draw extra cards for additional clarification, especially when reading a Grand Tableau. Due to using all 36 traditional Lenormand cards for the Grand Tableau spread it is usually not possible to draw extra cards for additional clarification unless you are using a second deck. Another deck is not necessary with the Aquarius Gypsy Lenormand since there are an extra 34 cards when using the first 36 cards as a traditional Lenormand deck. The second manner of use focuses on using only cards numbered 37 – 70. This provides you with a 34-card oracle deck. I have gotten very clear readings for myself using only the Gypsy cards of this system. Readings are concise and to the point, as they are with the traditional Lenormand cards numbered 1 – 36. The third use of this deck is as a 70-card oracular system. The traditional 36 Lenormand cards and the additional 34 Gypsy cards work very well in tandem together. The two systems play quite nicely and readings are thorough and easy to understand, even for a novice. Card interpretations are provided printed out onto four sheets of typing paper, size A4. Pages 1 – 3 are printed on both sides while page 4 comes to nearly half a page of printed interpretations, thus providing deck users with nearly 6 ½ pages of card interpretations. Interpretations for the first 36 cards of the Lenormand follow traditional Lenormand card interpretations while interpretations of the 34 Gypsy cards combine Gypsy interpretations with some Tarot (Empress, Emperor, Wheel, Lightning as the Tower, Doorway as Judgment, Hermit, Fool, Oracle as the High Priestess, and World. The Gypsy cards also include four cards that correspond to the four seasons, which are great if they appear in a reading concerned with the timing of an event or situation. Images are photographed with some of them being within the public domain. The actual image area measures 2 7/8 X 1 15/16” surrounded by a mottled purple border that measures at top and bottom 3/8” and along the left and right the border measures ¼” wide. Due to their darker color the borders are not obtrusive. Usually, such wide borders bother me as a reader, especially when reading larger spreads, but that does not apply to the Aquarius Gypsy Lenormand deck. I enjoy using these cards very much. 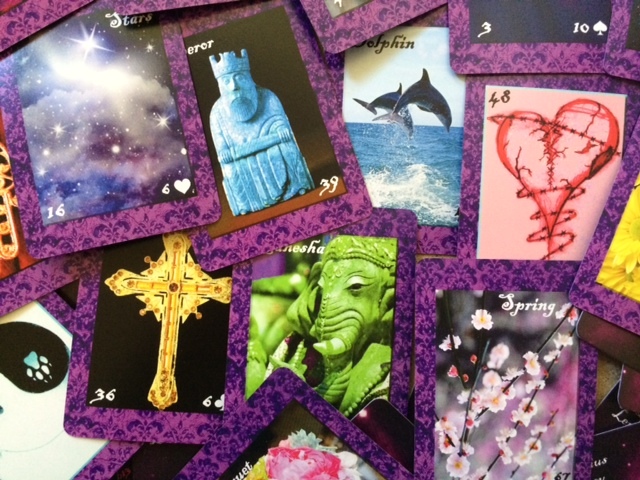 I have been working with them for a few months now and I have used a wide variety of spreads, some specifically designed for use with Lenormand decks, some designed for Tarot, and a few I have made up myself. The Aquarius Gypsy Lenormand deck lends itself well to every spread I have tried. Readings are clear, to the point, and easy to interpret. As a result, I would definitely recommend the Aquarius Gypsy Lenormand to beginners and advanced readers alike. 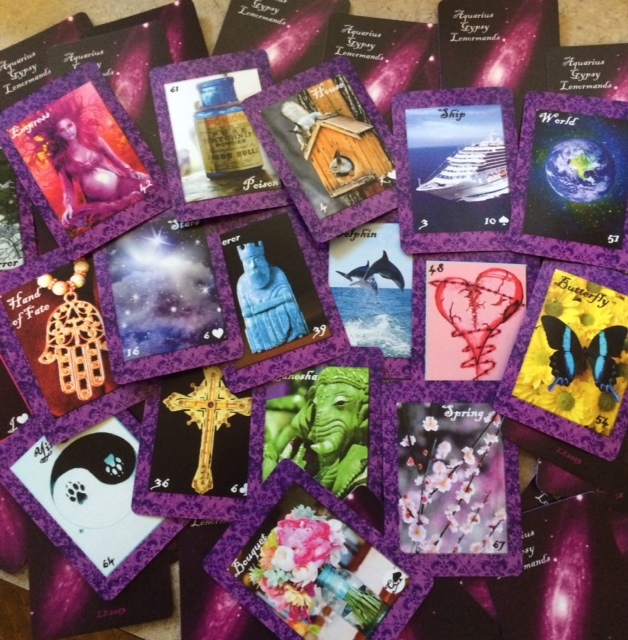 There is a great deal of enjoyment to be had with this deck and Lynn Boyle has succeeded in creating a lovely contribution to the field of self-published Lenormand and oracle decks. Egyptian Lenormand: only FOUR copies of the self-published edition remain. I ship worldwide. Next The Egyptian Lenormand Goes to Press!